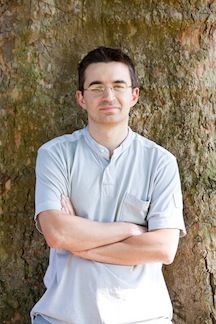 Macedonian-born composer/violinist Mihailo Trandafilovski studied at Michigan State University, USA (BMus) and the Royal College of Music, UK (MMus, DMus). His work has been supported by the Macedonian Ministries of Science and Culture and the British Government (Chevening scholarship), amongst others; awards include the Panče Pešev Award for best new piece at the contemporary music festival Days of Macedonian Music. He is a member of the Kreutzer Quartet, with whom he has performed and recorded extensively, and is one of the founders and a Music Director of FuseArts, a not-for-profit organisation supporting shared projects among the arts and promoting contemporary artistic creativity to a wider audience. Amongst recent commissions are a clarinet quintet for Roger Heaton, violin concerto for Peter Sheppard Skærved, and a new work for the New London Chamber Choir. Other performers include Quatuor Diotima, Pierrot Lunaire Ensemble Wien, and the Moscow Contemporary Music Ensemble. A portrait CD with his chamber music performed by Lontano (conductor Odaline de la Martinez) and the Kreutzer Quartet was released in 2011 by LORELT.